Nominee Mandy Moore hit the red carpet this evening(January 7th) for the 75th Golden Globe Awards at The Beverly Hilton in Beverly Hills, CA. 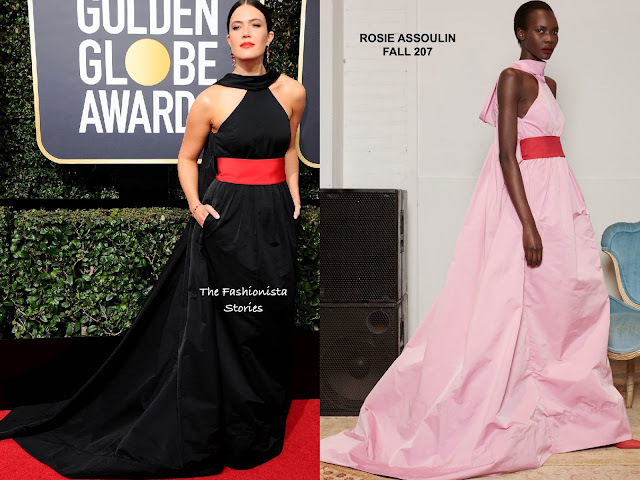 While Mandy's gown was shown in pink in the look book, to stay on tune with the hue of the night, she wore her ROSIE ASSOULIN FALL 2017 black taffeta halter gown in black. Her gown which featured a tie neck detail & side pockets, was also adorned with a contrasting red waist band which provided a nice cinch waist. A center part up-do, a bold red lip and statement jewelry finished up her look.